I created this sketch with pen and ink. 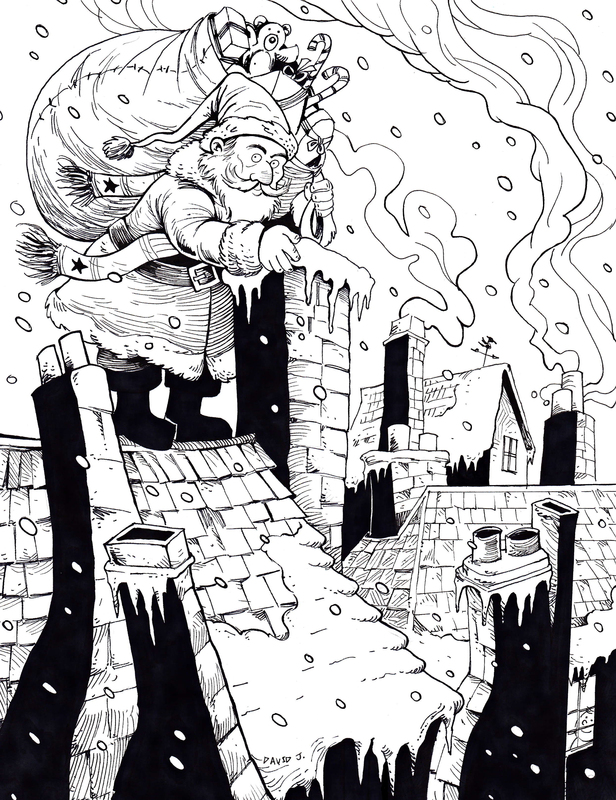 I have no idea how Santa fits down chimneys. Wait, I do have an idea…. magic. Happy holidays. I’ll post again in 2014. I created some more drawings with a Staedtler Fineliner pen and a Faber-Castell brush artist pen. These drawings are more Fiend Folio inspired illustrations. As a disclaimer, these drawings are neither created nor are they endorsed by the current copyright holders of TSR’s former property. 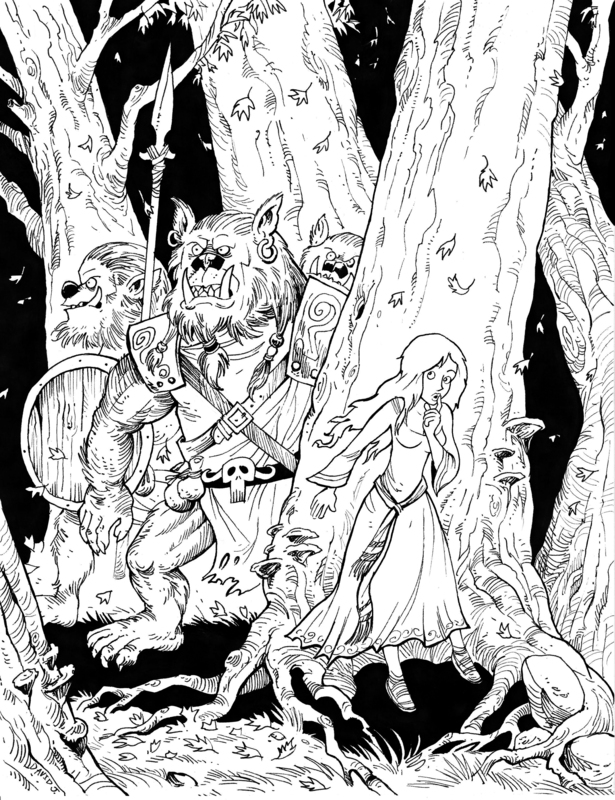 The first drawing is of a pack of Bugbears going for a walk in the woods. The second sketch is a Grell and Neo-Otyugh. 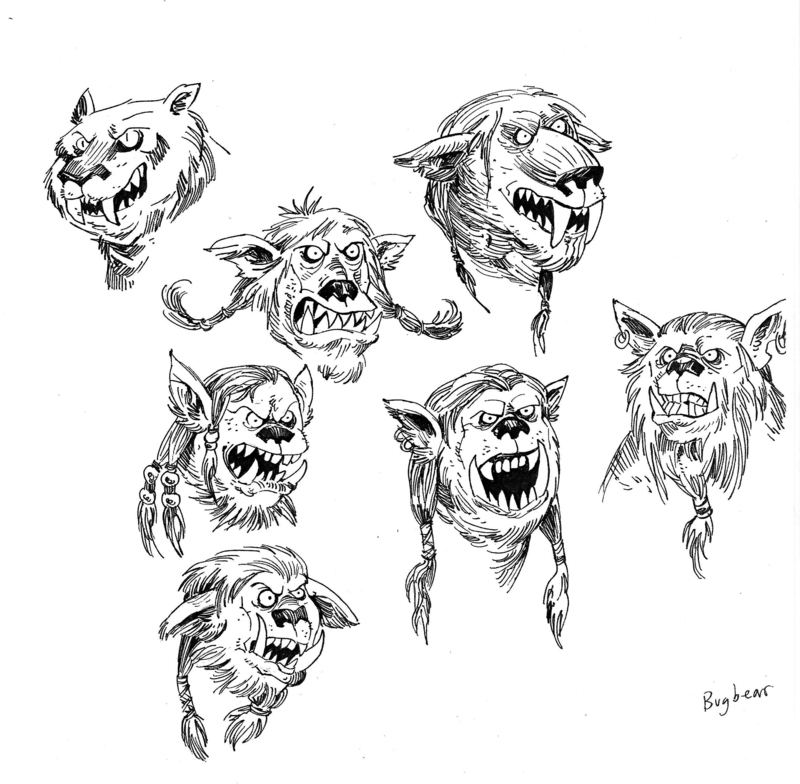 The last sketch is just some head drawings for the Bugbear drawing. When I was young, my brother had a whole bunch of the TSR monster bendy toys from Dungeons and Dragons. He had the Grell and Neo-Otyugh toys and they were a great deal of fun to play with. 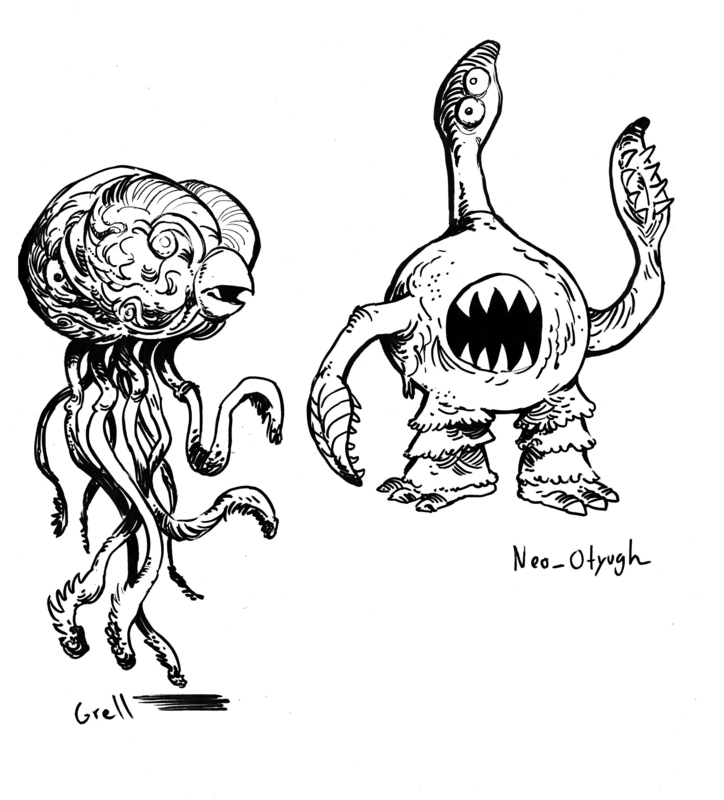 I like how the Grell and Neo-Otyugh sketch turned out. I created an illustration for my friends Ryan and Audrey Durney’s multi-contributor book entitled Birds of Lore. Ryan teamed up with his wife Audrey to create a lavish bestiary of mythological birds. 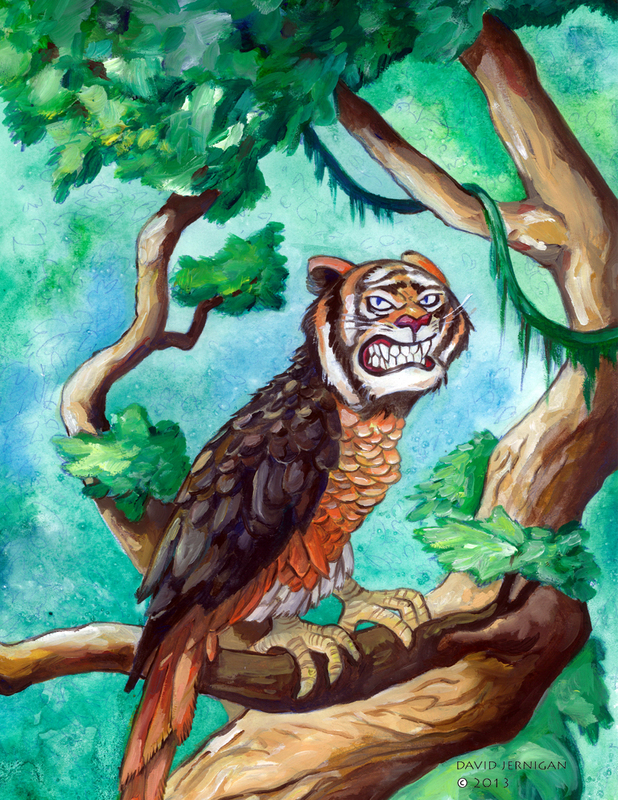 The creature I illustrated is a tiger-bird called a Suea Peek. Ryan described it as a stout, semi-flightless bird beast, with the head of a female tiger. I love how ridicules and fearsome it looks at the same time. I used oil paints over a watercolor underpainting to create the illustration. 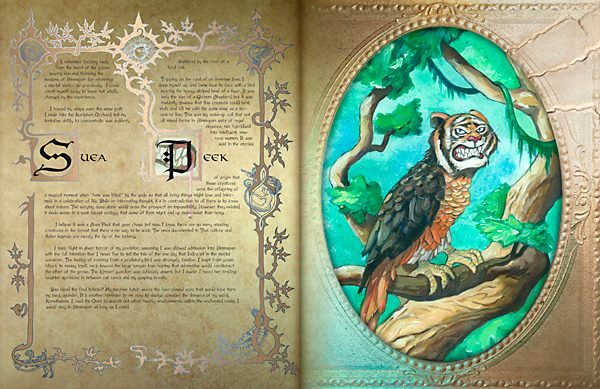 Ryan’s Birds of Lore book is now out on Amazon and he even produced a Kindle edition.